This was a definite case of judging a book by its cover. 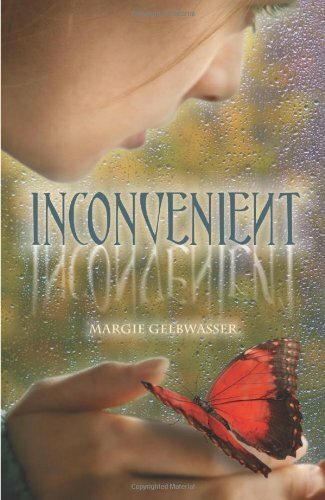 I've had Inconvenient by Margie Gelbwasser on my bookshelf for months. The cover art did not appeal to me and the title is forgettable (I read it a few days ago and had to recheck before writing the review--was it Irreversible? Inconceivable? Ah, Inconvenient!) I am happy I finally picked it up because this is a debut novel worth reading. Alyssa is a Russian-American teen living in a judgmental New Jersey town. She and her friend Lana are eager to fit in with the popular crowd at school, with Lana willing to go to ever-greater lengths for status. Gelbwasser beautifully describes the feelings of growing apart from a best friend, particularly the realization that you have been excluded. The real focus of the novel is Alyssa's mother's increasing dependence on alcohol and how it is dealt with in a Russian Jewish community where alcohol is a part of the culture. Seen as "inconvenient" by Alyssa's workaholic father and normal by the other Russian adults, the responsibility of running a household and keeping the secret falls to Alyssa. The depiction of an alcoholic parent is extremely realistic and refreshingly unique with the added cultural element. I've never read a novel from this point of view before, and it was eye opening for me. There is some sexual exploration and a few innuendos in the novel, which is disappointing because it limits the age range for the novel. Without those aspects, I'd consider it appropriate for most middle school students. As it is, I will be recommending it to alumni who love realistic fiction and are better than I am at ignoring lame covers!